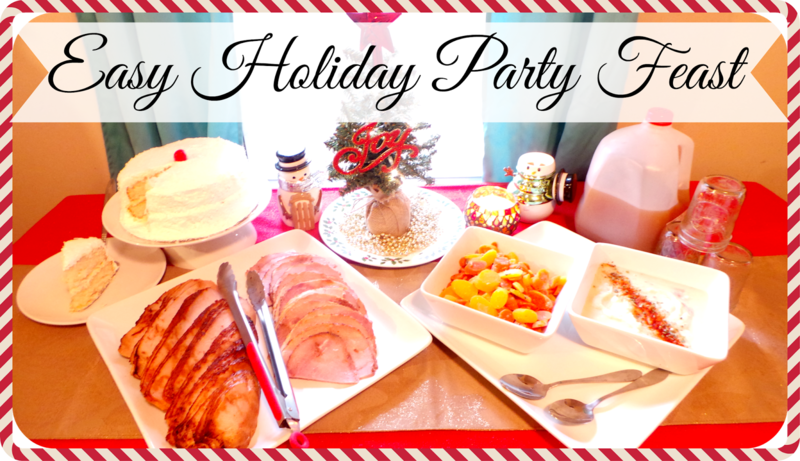 I created a beautiful holiday feast in no time using Honeybaked products. I went to my local Grand Rapids, MI Honeybaked store and browsed their selection. The staff is so friendly and really helpful. I chose to purchase 2 lbs of Honeybaked ham (serves 4-5), around 3-4 lbs of Honeybaked smoked turkey breast (serves 6-8), 1 heat & share garlic mashed potatoes, 1 heat & share orange basil glazed carrots, 1 coconut cake, and 1 ham bone and soup mix (for a later meal). To set my Christmas table as a buffet I simply covered the table in a sparkly red table cloth, placed a gold fabric runner along the middle and decorated with some of my favorite holiday items and candles. I used a large platter to fan out the Honeybaked ham and turkey and placed a pair of tongs there for my guests. For the sides I simply microwaved them according to the package directions and then poured into a pretty bowl to serve along with a serving spoon. I served the cake on a platter after letting it thaw and placed a pie server with that. A jug of cider and glasses were added and we had the perfect holiday feast! This would be so easy for anyone to re-create. It could definitely be elaborated upon depending on how many guests you needed to serve. Our holiday feast was phenomenal, everyone loved the food. The heat & share sides are incredible and as the name denotes, you simply heat them up and serve. You can serve in the black tray they come in or put into the dish of your choice, it is up to you. Honeybaked has so many different sides to choose from, everyone will be happy. The dessert selection has several to choose from so depending on your tastes you could go with a lot of different delicious options.